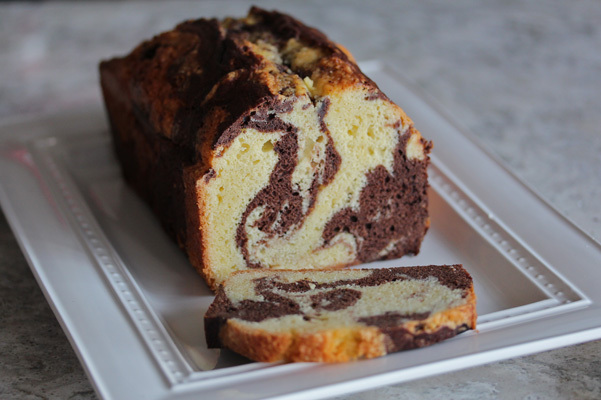 The visual impact of a Marble Pound Cake is further fortified by the fabulous taste – a combo of rich, buttery vanilla flavored cake marbled with a cocoa enhanced batter. 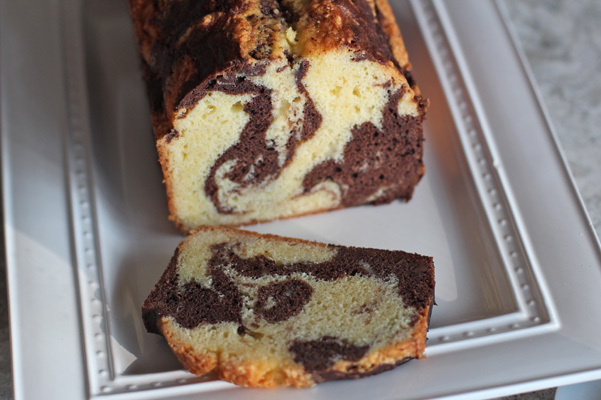 Perhaps we should call this a pound-style cake as it has a bit of leavener added, which varies from the traditional. It is very similar though with a rich flavor and texture from the high ratio of butter and eggs. How do we get the cake to look so striking with its contrasting batters? You might be surprised. And it is easier than you think. Make sure to use Dutch-processed cocoa, which has a very different acidic content than natural. If you cannot find instant espresso powder you can use instant coffee. By the way, you don’t really taste the coffee – it just punches up the cocoa flavor making it deep and chocolaty. Set oven rack to center position. Preheat oven to 325°F. Coat an 8-inch x 4-inch metal loaf pan with baking nonstick spray (the kind with fat and flour), such as Baker’s Joy. Line the bottom with a strip of parchment paper that extends up and out of the short sides of the pan; coat the paper as well. Whisk together the flour, baking soda and salt in a medium bowl; set aside. Whisk eggs together in a large measuring cup or whisk in a bowl and transfer to a pitcher with a spout. Place cocoa and instant espresso in a medium heatproof bowl. Pour boiling water over and whisk until smooth. (This bowl needs to be large enough to hold half of the batter eventually). Beat butter with electric mixer (use flat paddle if using stand mixer) until smooth and creamy, about 2 minutes. Use time cues as suggestions but primarily look to the visual cues throughout the recipe. Gradually add the sugar (in quarter-cup amounts; you can do this by eye) and beat on high speed until mixture has lightened and is very fluffy. This might take as long as 3 to 5 minutes; scrape down the bowl once or twice during beating. Do not rush this step. The mixture should be room temperature at this point. Turn off the mixer and touch it to check. Keep beating if it is cool to the touch. Beat in vanilla. Add the eggs about a tablespoon at a time (you can do this by eye), beating well after each addition and scraping down the bowl occasionally. Once all the eggs are added beat mixture for about 30 seconds to make sure it is thoroughly combined. The mixture should be smooth and satiny. If it looks curdled or separated in any way it is because the mixture is still too cold. Let the mixture sit to warm up a bit and beat again, looking for the visual cues as described above. Remove bowl from stand mixer (if using) and sift about one-third of the dry mixture over the batter and use a large silicone spatula to gently fold in the dry mixture. Stop when there are a few floury streaks remaining then add next batch of flour mixture and continue until all flour/salt has been added. Make sure all of the dry mixture mixture has been incorporated into the batter to create a thick and smooth homogenous batter. Divide batter in half by transferring half into the bowl with the cocoa mixture. Stir the batter and the cocoa mixture together gently until combined. Place alternating ¼-cup sized amounts of the two batters into your pan; you can do this by eye with a spoon or use ice cream scoop. The top will not look smooth. That’s okay; it will smooth out during baking. Bake for about 1 hour and 10 minutes to 1 hour and 20 minutes or until a toothpick just tests clean. The toothpick should look a bit moist and not bone dry. Rotate the pan once front to back halfway through baking. The range of time will depend on the temperature of your ingredients when the cake went in the oven. Cool pan on rack for about 10 minutes then unmold, peel away parchment, place loaf upright and cool completely. Store at room temperature well wrapped with plastic wrap for up to 4 days. Using two spoons, one for each color batter, to place the batters in the pan will give you the cleanest, visual results. 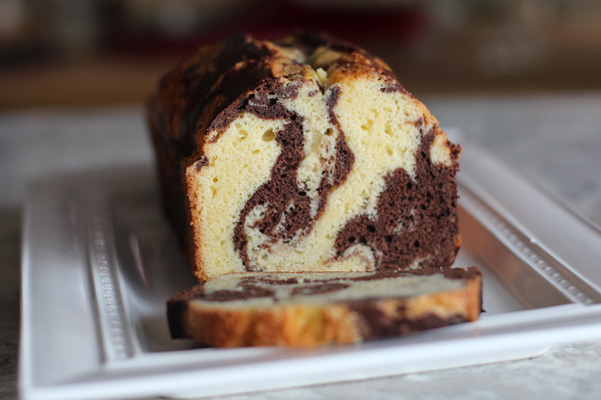 The texture and flavor of the cake improves after sitting overnight. The pound cake will also slice best after a night’s rest, well wrapped on the counter. Do not refrigerate as that will dry out the cake.